Vaccination is one of the most successful and cost effective public health interventions in preventing infectious diseases. High coverage of vaccinations is required for effectively interrupting the transmission of infectious diseases in the communities. With this intent, the Universal Immunization Program (UIP) was launched in India in 1985 targeting six main Vaccine Preventable Diseases (VPD) namely tuberculosis, diphtheria, pertussis, tetanus, poliomyelitis and measles. The coverage of vaccination in India has remained average to low through the years. The state of Tamil Nadu which has some of the best health indicators in the country has an interesting pattern of vaccination coverage. In the National Family Health Survey NFHS 1 (1992-93) the coverage of all basic vaccines was about 65%, which drastically increased to 89% in NFHS 2 (1998-99)., NFHS 3 (2005-06) saw a vaccination coverage rate of 81%, a reduction over the coverage in NFHS 2 and the NFHS 4 (2015-16) saw a further reduction to 69%., This trend of reduction in vaccination coverage in a high performing state is a matter of concern. A state-wide representative coverage survey conducted in 2017 revealed a full vaccination coverage of 79.9% and appropriate vaccination coverage of 69.7%. Despite having a robust and well-functioning health system some states face reduction in vaccination coverage due to vaccine hesitancy. The term vaccine hesitancy stands for the delay in acceptance or refusal of vaccines despite easy access to the vaccines. Several factors have been said to influence vaccine hesitancy including socio-cultural context, religious beliefs, misinformation spread through social media, historical influences and mistrust, beliefs and attitudes about vaccines and specific characteristics of the vaccines. A vaccine decision making model typically involves receiving information about vaccines, active engagement with the information and decision making, which is strongly influenced by social, political, economic, religious and cultural factors. Trust in the vaccination policy, health system, vaccine providers and specific vaccines also plays a major role. There is a need to understand the phenomenon of attitudes towards vaccinations and vaccine hesitancy among parents of children between 1 and 5 years in Tamil Nadu. This understanding will help to inform the state’s vaccination policy for further improving the coverage rates. The study was conducted in the paediatric out patient department of a tertiary care hospital in Chennai, India. The hospital serves people who are covered under a national contributory social health insurance scheme that covers employees earning less than a certain amount per month. The insurance scheme provides for maternity, child health, sickness, medical, and disability benefits. Chennai is the capital city of Tamil Nadu and the hospital is located in the heart of the city. The participants included in the study were parents of children between 1 and 5 years of age attending the paediatrics out patient department of the tertiary hospital. Participants who met this criterion were consecutively selected from the out-patient clinic in the period of June-July 2018. The prevalence of vaccine hesitancy in this population has not been previously documented. Therefore, assuming that the prevalence will be about 50%, and for a 95% confidence level and 20% relative precision of estimate, the sample size was calculated to be 100. The 100 samples were identified by non-probabilistic consecutive sampling method from the paediatric out patient department. The study used a questionnaire which comprised of three parts namely – (1) socio-demographic details of the respondent, spouse and child, (2) a scale to measure the parental attitude towards childhood vaccines and vaccine hesitancy and (3) a scale to measure beliefs and attitudes towards childhood vaccines., The Parent Attitude towards Child Vaccines scale is a valid and reliable measure of parental attitudes and vaccine hesitancy. This scale has not been previously validated for the Indian context. Therefore, the scale was validated by content validity method among experts in paediatrics and public health who evaluated the relevance of the scale in the Indian context and cultural and social appropriateness of the statements in the scale. The questionnaire was translated to Tamil, the local language and the validity of translation checked by an independent expert. A trained interviewer used the translated questionnaire to interview the respondents who consented to participate in the study. Their responses were marked in the paper-based questionnaire. The data was later entered into an Excel spreadsheet and was analysed using the SPSS Statistical Software version 21. The study was approved by the Institutional Ethical Committee of the institution of origin of this study. Informed consent was obtained from all participants before data collection. Adequate privacy was provided during the interviews and the details of the participants were maintained in strict confidentiality. A total of 100 consecutive parents attending the paediatrics out patient department were approached for the study and all of them consented to participate. The socio-demographic characteristics of the respondents and their children are shown in [Table 1]. All the children who were part of the study had full coverage of all age appropriate vaccines. It was observed that about half of the children were in the 4-5 years age group. There was an almost equal distribution of boys and girls. More than half (65%) of the mothers were below 30 years of age, about 57% were home makers and about 40% had college education. This profile reflects a middle class, educated, working class population of a typical Indian urban area. 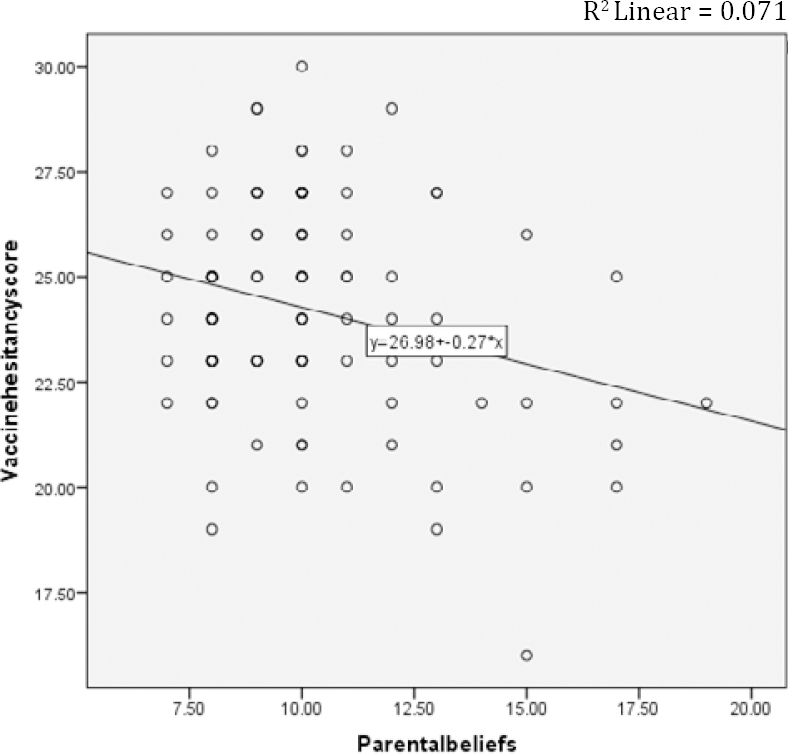 [Table 2] and [Table 3] show the responses of the parents on the scale on parental beliefs and attitudes. It was found that while most parents (94%) thought that the diseases prevented by vaccines are all severe ones, a substantial number (64%) thought that children receive more vaccines than necessary and about half of them thought that it is better to acquire immunity by natural methods. The responses also revealed that a majority (90%) of the respondents were concerned about adverse effects of vaccines as well as failure of vaccines. Though majority knew that vaccines protect their children from diseases, however the main motivator for vaccinating their children was to gain entry to school (schools require that children get vaccinated fully and produce the certificate of vaccination). 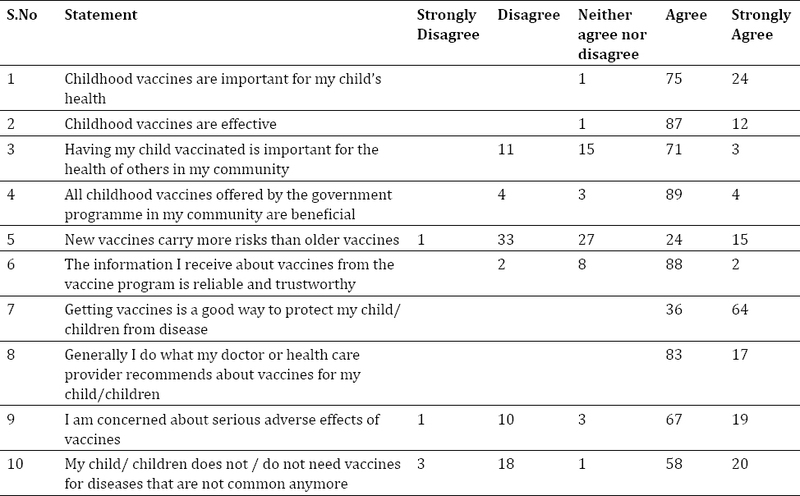 [Table 4] shows the responses of the parents to vaccine hesitancy questions. It is noteworthy that there is a tendency of suspicion towards newer vaccines, concerns about adverse events following vaccination and a feeling that vaccines are not necessary for diseases that are not common. These responses indicate a sense of hesitancy in a small proportion of the sample and the main reasons for their hesitation. The parental belief scale was scored in such a way that higher scores indicated better attitudes towards vaccines. Similarly, the vaccine hesitancy scale was also scored to indicate higher scores to indicate greater hesitancy. The overall vaccine hesitancy score was plotted against the parental belief and attitude scores and correlation coefficient calculated. This is shown in [Figure 1]. This study systematically documented the tendency of vaccine hesitancy and attitude among parents belonging to an educated, middle class, working population in a metropolitan city of India. The main findings of the study are that the parents felt that vaccines are important as they prevent serious illness, but they also felt that children nowadays receive more vaccines than necessary and instead they should be allowed to acquire natural immunity against infections. The parents were concerned about adverse events following vaccination. About 21% reported hesitancy to vaccinate and 10% reported refusal to at least one vaccine (mostly outside the Universal Immunization Program schedule). The main factors influencing vaccine hesitancy were scepticism against newer vaccines, concerns about adverse events and the feeling that vaccines against uncommon diseases are not necessary. It was also observed that vaccine hesitancy is inversely proportional to attitudes towards vaccines. A previous study from the same area showed that parents had a great level of trust in the health system and the vaccination policy. Therefore, they were willing to vaccinate their children. However, they did not take up optional vaccines as much as the mandatory vaccines in the government vaccination schedule. The reasons cited by this study was high cost, lack of awareness and concerns regarding safety. The major reason for the perception that the vaccines are too many is probably concern regarding their safety. Introduction of newer vaccines are associated with concerns regarding their safety. One of the major reasons found in this study for hesitancy was concerns regarding safety. Previous studies of vaccine acceptance in the same area for the newly introduced Measles-Rubella vaccine also revealed that trust in the health system and suspicious about new vaccines spreading through social media campaigns had a strong influence on vaccine hesitation. Therefore vaccination programs and policies have to feature strong community engagement strategies to increase awareness about the vaccines and remove fears associated with them. This study has documented that about 21% of the interviewed parents reported some form of hesitancy to vaccinate their children. A previous study from the same area has documented that the level of vaccine hesitancy is low and the reasons behind the strong motivation of the parents to vaccinate their children in this area can be adopted to reduce hesitancy in the United States. However, the vaccine hesitancy reported in this study is higher. This is likely to be due to overall better educational attainment, better socio-economic status and greater levels of awareness among the respondents. This higher vaccine hesitancy is likely to be present in many of the metropolitan areas and educationally and socioeconomically developed areas of the country. Such hesitancy to undergo vaccination has also been reported previously in Kerala, which has a high level of literacy and good health indicators. There is a clear trend of greater vaccine hesitancy in areas with higher socio-economic status and higher education and awareness. In states like Tamil Nadu and Kerala which have good health indicators, the time period between NFHS 3 and 4 has seen a drastic fall in vaccination coverage rate., While various authors have referred to important systemic issues related to such fall in vaccine coverage, one of the main issue to be considered is the demand side factor of vaccine hesitancy. The important finding of this study is majority of the vaccine hesitancy is to newer vaccines, concerns regarding safety of vaccines and the perception that vaccines are not necessary for illnesses that are uncommon. There is a need to develop interventions at the community level to address these concerns. Active community engagement before introduction of newer vaccines, to allay any anxieties in the minds of the parents is very important. Awareness should be created certain infections are rare is due to effective vaccination coverage the myth to stop vaccinating children against uncommon diseases. Such awareness programs will help address vaccine hesitancy and ensure active community engagement in the vaccination program. To the best knowledge of the authors this is the first study to evaluate vaccine hesitancy in a systematic manner in the Indian context. Therefore, the study provides insights to this issue, so that interventions can be planned to improve vaccination coverage rates even in the well-developed states. The limitations of the study include a small sample size, non-probabilistic sampling method, and a cross sectional design, which precluded any causal association between vaccine attitudes and hesitancy. Future studies should aim at performing a 30 cluster sampling method of vaccine coverage as recommended by the World Health Organization (WHO) and United Nations Children’s Fund (UNICEF). Qualitative studies of vaccine hesitancy in the Indian context, should inform development of a unique scale to measure vaccine hesitancy in India. This can better conceptualize the construct of vaccine hesitancy in India. Even among populations with near universal vaccine coverage, vaccine hesitancy exists. The main driving factors for such vaccine hesitancy are concerns regarding its safety. Vaccine hesitancy should be evaluated thoroughly in the Indian context in order to strengthen the Universal Immunization Program. Lahariya C. A brief history of vaccines & vaccination in India. Indian J. Med. Res. India; 2014;139:491-511. Gopichandran V. Public trust in vaccination: an analytical framework. Indian J. Med. Ethics. 2017;2. Larson HJ, Jarrett C, Schulz WS, Chaudhuri M, Zhou Y, Dube E, et al. 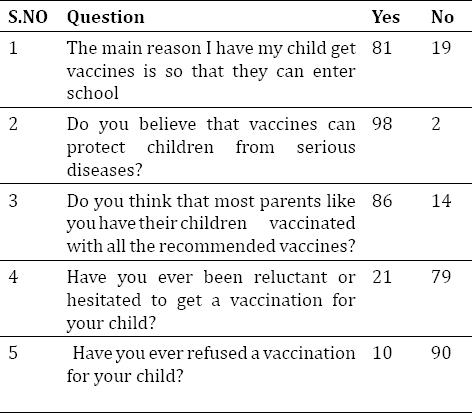 Measuring vaccine hesitancy: The development of a survey tool. Vaccine. 2015;33:4165-75. Oladejo O, Allen K, Amin A, Frew PM, Bednarczyk RA, Omer SB. Comparative analysis of the Parent Attitudes about Childhood Vaccines (PACV) short scale and the five categories of vaccine acceptance identified by Gust et al. Vaccine. Netherlands; 2016;34:4964-8. Manthiram K, Blood EA, Kuppuswamy V, Martins Y, Narayan A, Burmeister K, et al. Predictors of optional immunization uptake in an urban south Indian population. Vaccine. Netherlands; 2014;32:3417-23. Braka F, Asiimwe D, Soud F, Lewis RF, Makumbi I, Gust D. A qualitative analysis of vaccine safety perceptions and concerns among caretakers in Uganda. Matern. Child Health J. United States; 2012;16:1045-52.